Expanding our spiritual practice is actually a process of expanding our heart, of widening our circle of insight and compassion to gradually include the whole of our life. Being on earth here in human bodies, this year, this day, is our spiritual practice. It used to be that most of Eastern spiritual practice was preserved by monks and nuns in monasteries and temples. For centuries much of Western contemplative practice in Europe took place in cloisters as well. In our modern times, the monastery and temple have expanded to include the world itself. Most of us are not going to live as monks and nuns, and yet as lay people we seek a genuine and profound spiritual life. This is possible when we recognize that where we are is our temple, that just here in the life we are leading we can bring our practice alive. My old guru in (Mumbai) would teach us in this way. He would let students stay just long enough to come to some genuine understanding of life and love and how to be free in the midst of it all. Then he would send them home, saying, "Marry the boy or girl next door, get a job in your own community, live your life as your practice." On the opposite coast of India, Mother Teresa (would send) home the hundreds of volunteers who come to help in (Kolkata), saying, "Now that you have learned to see Christ in the poor of India, go home and serve him in your family, on your street, in your neighborhood." "This earth is our mother. Whatever befalls the earth befalls the sons and daughters of the earth. This we know. All things are connected like the blood which unites one family. [...] We did not weave the web of life, we are merely a strand in it. Whatever we do to the web we do to ourselves." 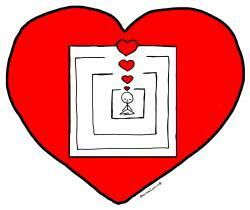 When the heart is undivided, whatever we encounter is our practice. Seed questions for reflection: How do you relate to the notion that wherever you are is your temple? Can you share an experience of a time you were able to treat what you encountered as your practice? What helps you be an undivided heart? Jack's reflection was an affirmation of the decisions I have taken in my life. It makes me so happy to know that where I am at present is where I ought to be and in fact, it is a holy place! At no point in my life, I have regretted the decisions I have taken. My decision to marry my wife and now the decision to live in a village away from the city is nothing short of where I should be. In Gratitude for this affirmation! "Death has not taken birth and Life never dies".Such total eternality of self consciousness (Atman) is in fact that Temple & God really we are longing for and nothing else. I have found this earnest search is the key to the practical spirituality.You are in everybody and everybody is in you made possible by an undivided expanded heart.This is only and simply the love,compassion, sympathy & empathy connecting all in a single worldwide web. I agree with you about sharing food or giving money to homeless iindividuals and I seldom passs one by without giving them money but regrettably, they are so lonely, sick of being homeless they spend it on alchohol as an escape. Reading Jack Kornfield's writing makes me feel at home. It is like home coming. I was raised in a poor family of nine members: father, mother and four brothers and three sisters. In spite of poverty, we felt spiritually whole and wealthy.Our parents embodied spirituality in everyday living. Every evening we used to go to the nearby temple to pray and worship. Our parents made a little shrine in our home and we used to pray every morning.Our home was our temple, Love, truth,compassion, grace and forgiveness were the foundations of our family temple. That became the way of our living.We were blessed to live near the Gandhi Ashram and used to attend evening spiritual gatherings in the presence of Mahatma Gandhi. Gandhiji inspired us and reinforced our spiritual way of living.When a journalist asked Gandhiji, "What is your message? ", his answer was simple and profound, " My life is my message." My everyday spiritual practices, prayer and meditation, help me to live from my undivided heart. My work is my worship. My living is my prayer. I would like to conclude my reflections by quoting Chief Seattle: " We do not weave the web of our life; we are merely the strand in it. Whatever we do to the web we do to ourselves." May we make our New Year's resolution: let our home be our temple and let us embrace spirituality with an undivided heart! Jack Kornfield's essay and Chief Seattle's statement are beautiful. Wherever you are is your temple, out of which and with which you can express the love from which the temple arises. The challenge is for us to do that. At those times that I live with awareness that we are one, when I see the other as myself, I am compassionate rather than competitive, and I am living my practice. At those times that I live with awareness that all that is is one, I am aware that what I do to this planet and universe I do to everyone and everything including myself, and I am living my practice. What helps me have an undivided heart is reminding myself through thought, reading, discussion, reflection, meditation that I have an undivided heart that is part of an undivided universe. Such awareness brings me peace, joy, and satisfaction.